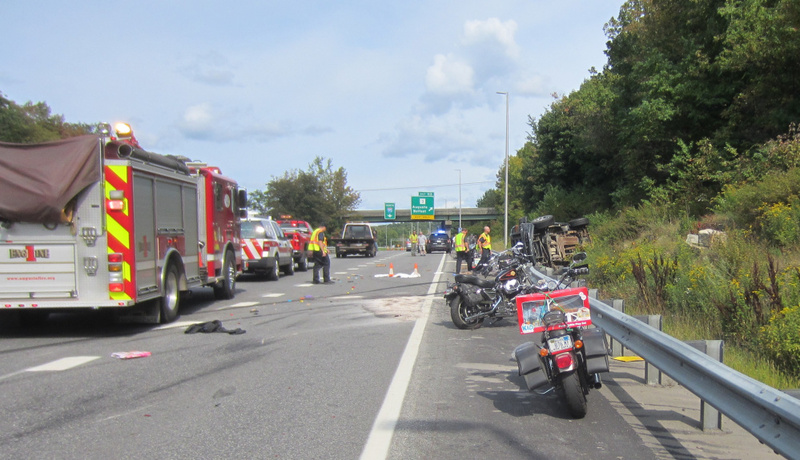 The accident on Interstate 95, which killed two motorcyclists participating in the United Bikes of Maine Toy Run, is still under investigation. 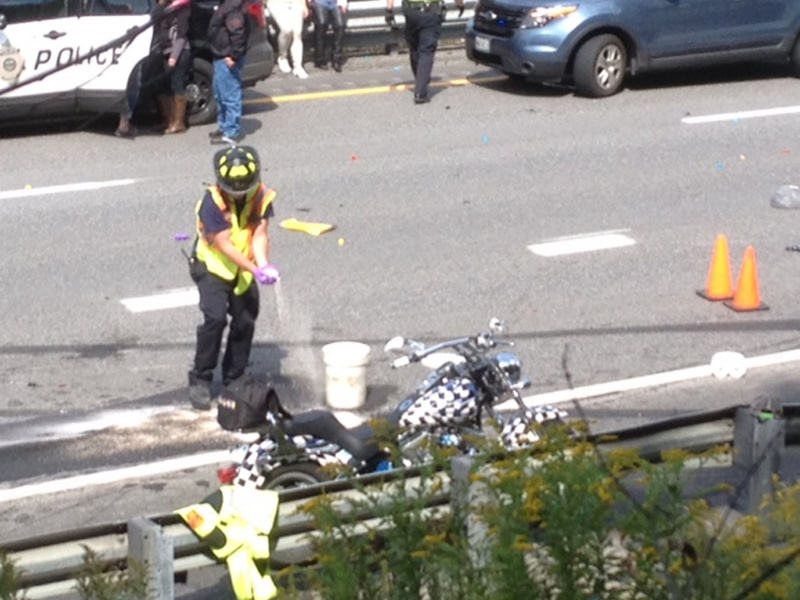 State police say a double fatal motorcycle crash on Sunday was caused when one of the motorcycles veered into the passing lane and into the path of a pickup truck on Interstate 95 in Augusta. Two men, including the one police say caused the crash, were killed while taking part in the annual United Bikers of Maine Toy Run, which gathers gifts for needy children. Investigators determined Jamie Gross, 58, of Belmont, started a chain reaction of crashes when he was struck by a pickup truck driven by William Nusom, Maine Department of Public Safety spokesman Stephen McCausland said in a news release Thursday. Nusom, 67, of Hollis, attempted to avoid striking Gross’ motorcycle and steered into the median guardrail. He lost control of the truck, traveled across three northbound lanes and struck other motorcycles participating in the Toy Run. Nusom’s truck overturned on its side. 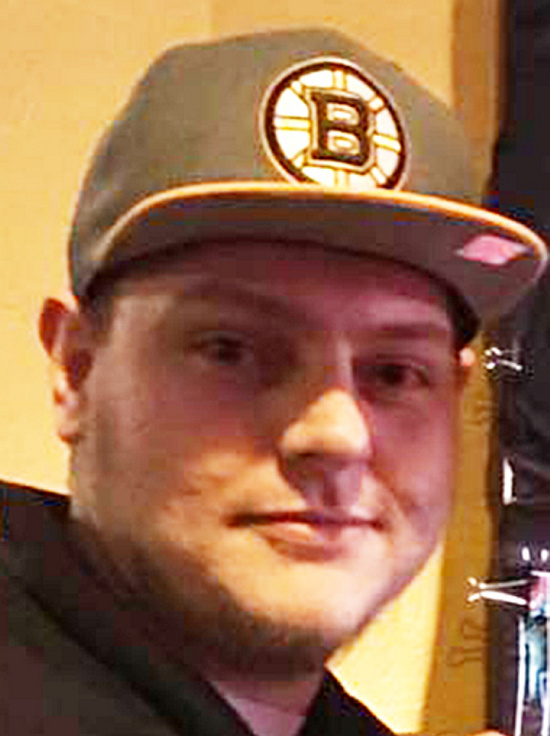 One of the motorcyclists struck by Nusom, Aaron White-Sevigny, 25, of Windsor, was injured seriously and later died in a hospital. State police are continuing to investigate why Gross left his travel lane, and McCausland said that investigation is expected to take several weeks. 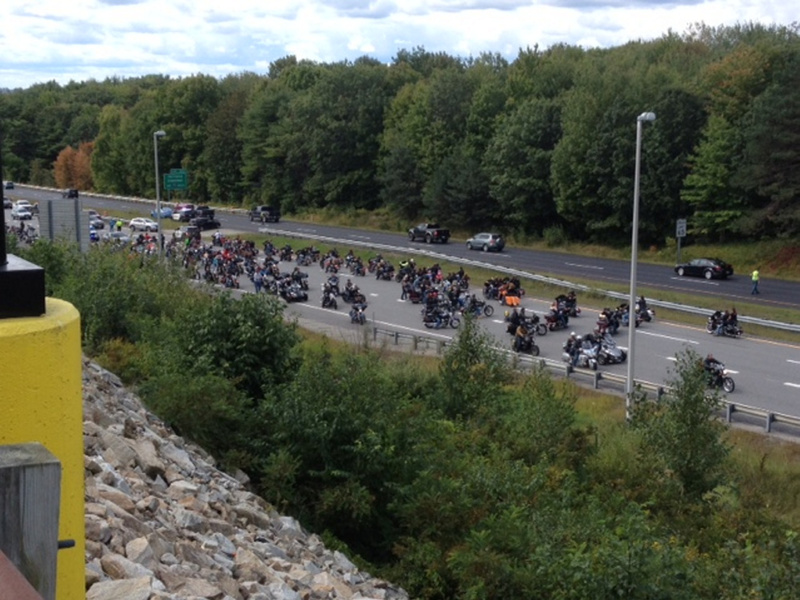 The accident occurred Sunday afternoon between exit 112 and exit 113 in Augusta, just as the charitable ride had left the Augusta Civic Center. The pickup truck was in the passing lane and the motorcycles, two among several thousand participating in the ride, were in the travel lane. Both were heading north. Both northbound lanes were shut down for about two hours and police also temporarily blocked one of the two southbound lanes to allow traffic to reverse direction and enter the southbound lanes. 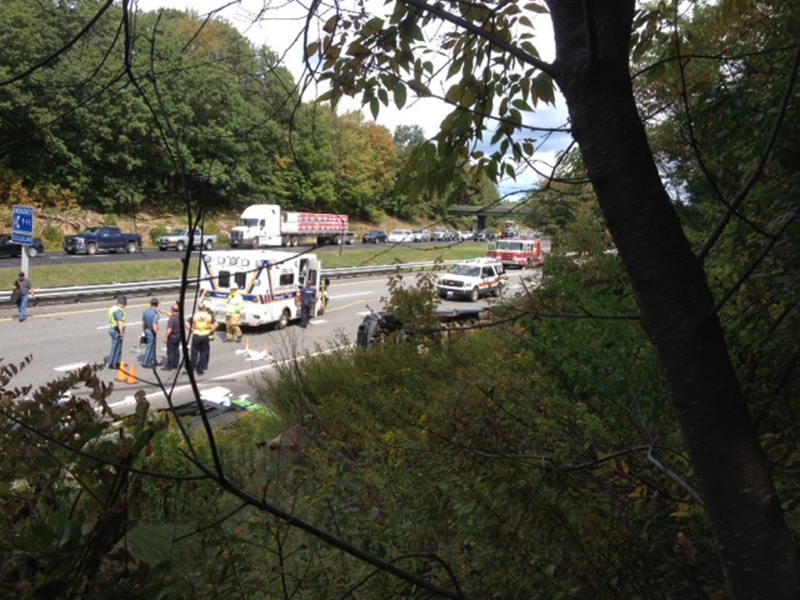 Vehicles also were detoured off the interstate at exit 109, south of the accident site. One northbound lane of Interstate 95 reopened to traffic around 2:15 p.m., according to the Maine Turnpike Authority, which warned that traffic delays still should be expected in that area. The second northbound lane was reopened to traffic by 4:30 p.m.
One motorcycle was on its side, as was a full-size pickup truck, near some broken guardrail on the side of the northbound lanes on the interstate. 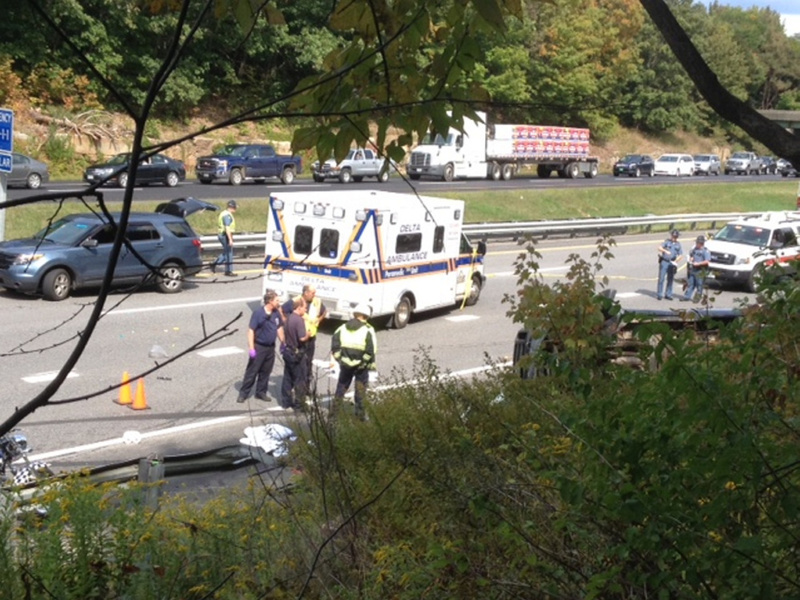 The accident occurred a few minutes past noon. Traffic backed up both on the interstate and in the area just off the interstate near Exit 112, on Civic Center Drive. Four other people were injured in the crash, including Nusom and his mother, Anna, 99, who were taken to a hospital with minor injuries. Two other motorcyclists — Trevor Proctor, 50, and Tori McGraw, 46 — were taken to a hospital with abrasions from sliding on the road. White-Sevigny was a father to a 1-year-old son and was engaged to be married, according to his obituary published in the Kennebec Journal. A GoFundMe page was created to raise money for funeral expenses and living expenses for his son, Lucas, and had raised more than $5,300 as of Thursday afternoon. He was a Boston Red Sox and Boston Bruins fan and enjoyed playing disc golf and fantasy football with friends. He also liked to fish, hunt and spend time with his family, especially his father. White-Sevigny’s funeral will be held Saturday at Plummer Funeral Home in Windsor. Gross was born in Frankfort and loved to fish, hunt and collect minerals. Recently, according to his obituary in the Penobscot Bay Pilot, he began taking long motorcycle rides. Gross’ favorite thing to do was spend time with his family, including his son Michael and grandsons Brendyn and Draven. There will be a public viewing Friday afternoon in Belfast and a private service Saturday.